If the bust/chest area of a sweater is too tight, you can fix this by messing around with the armhole length. Are you surprised? 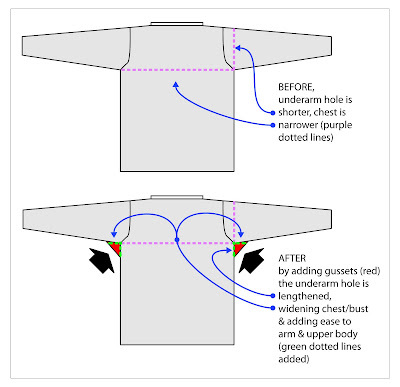 In fact, the fit of the upper body of a garment is very highly affected by the length of the armhole, and a great deal of the designer's attention is paid to the exact measurements in this complex, saddle-shaped area where many seams run together, and the arm meets the body of the sweater. The great thing about the upper body/armhole connection is that the entire fit around the bust/chest can be eased by lengthening the armhole (and, of course, the fit around the upper arm can also be eased in this manner). Although lengthening the armhole sounds like a project which would require re-knitting the upper part of the garment as well as reknitting the sleeves, this is luckily not the case IF (and only if) the garment was made in pieces (has seams). To lengthen the armhole, and thus add ease to the upper body area (and to the upper arm area, as well) we are going to use a gusset. A gusset is simply an inlaid piece of fabric specifically designed to add ease to the applied area. Our specific gusset, an underarm gusset for a sweater, is a diamond-shaped piece of fabric knit from the same yarn as the garment itself, then inserted (sewn in) along the top of the side seam and the top of the arm seam. As to how large to make the gusset, you must first determine how total many inches of ease you want to add around the garment at the bust/chest (or around the upper arm, if this is where the tightness is). You would then work each gusset until the total width at the widest point of EACH gusset is ONE HALF the total added ease desired, so that both gussets together add up to the total ease required around the circumference of the garment. Prep step: cast on, then work two rows of 2 st I-cord. row 3: k1, m1, k to with 1 st of opp edge, m1, k1. REPEAT rows 3 and 4 until the diamond is HALF as wide across as the total number of inches of ease you seek, as explained above. row 5: k across with no shaping. row 6: purl across with no shaping. row 7: k1, SYTK (or any other left leaning decrease you prefer), k to within 3 sts of other edge, k2tog, k1. REPEAT rows 7 and 8 until 5 sts remain on a purl row. row 9: k1, work a three stitch decrease (scroll) on the middle three stitches, k1. 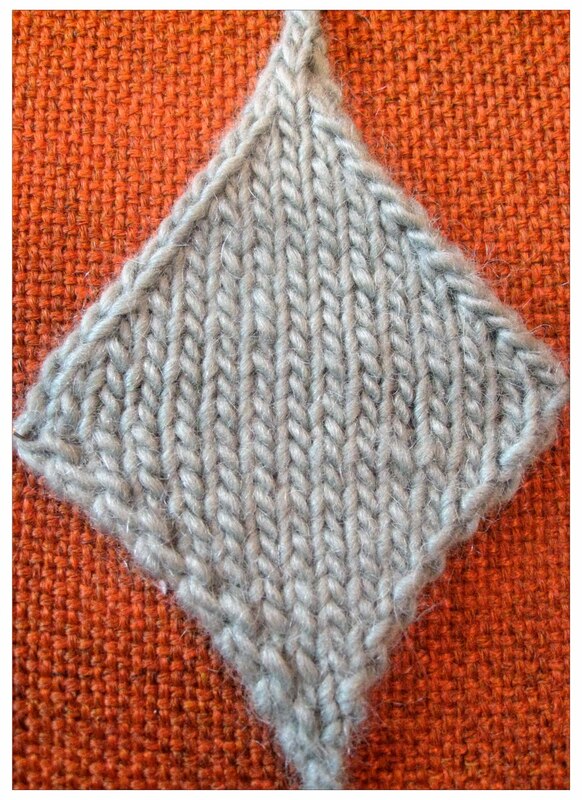 Below is a photo of a gusset knitted according to the above instructions, the widest measurement is 17 stitches. 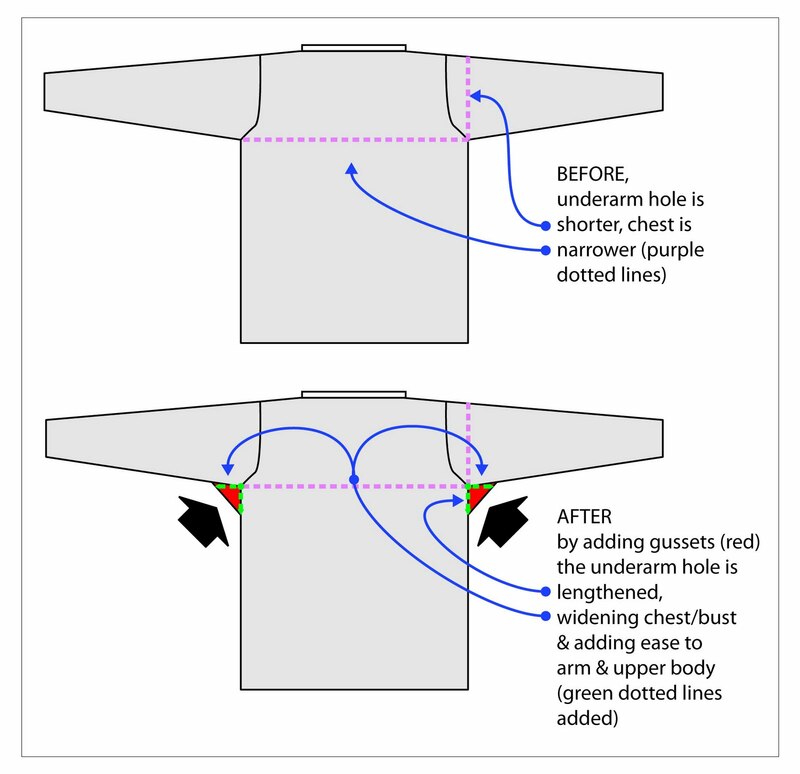 When you come to sew the gusset inside the garment, pick out (remove) the seam in the underarm area of your sweater (top of body, top of arm) beyond what you will need to sew in the gusset--this gives you some maneuvering room. To make sure of your gusset placement, begin the sewing centered on the center two (no shaping) rows (i.e. : rows 5 and 6) as shown in the illustration two below. Resew the body and sleeve seams above and below the gusset insertion and wear your remodeled sweater in health and good fortune. 3) The instructions included in this post for knitting the gusset result in a utility sort of a gusset which adds width in a relatively concentrated area--just at the underarm. If the problem extends past this area, work the gusset relatively longer (i.e." a longer diamond) by adding more plain rows between increases/decreases. This will add more ease in a longer stretch of both the body and the arm. Of course, if the problem is mainly in the upper arm, you can make the gusset shorter at the body end while knitting it longer along the arm seam. If the reverse is true--if the body is tight but the upper arm is pretty much OK in circumference, reverse the procedure--making the arm part of the gusset relatively shorter than the body portion to provide bust shaping with very little ease added to the arm circumference. In these ways, the gusset can be customized to your exact ease requirements. 4) For supergeeks: If you are a demon for symmetry, begin the gusset with a provisional cast on in the very middle of the gusset, then follow the directions for the decrease portion of the gusset. When the first half is done, remove the provisional cast on to re-gain live sts on your needle, then work the decrease portion of the gusset again. 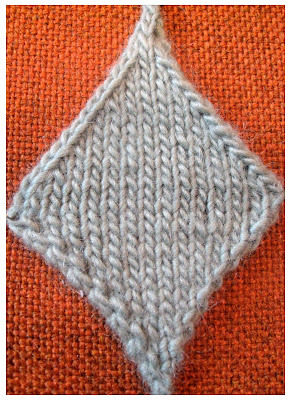 As you can see in the photo of the gusset, above, the decrease portion at the top of the gusset looks prettier than the increase portion at the bottom of the gusset, so by working both ways from the middle, you'll get two pretty decrease portions while avoiding the increase portion altogether. Finally we'll end with a note on gussets at the crotch, rather than under the arm. Crotch gussets are a great idea for adding ease in an often-tight area. These are quite common in eastern-style pants and leggings. While not common in western clothing, they are slowly becoming available as a specialty item. Those who knit longies (either baby-bottom leggings or children's/adult leggings) can add a gusset to the crotch area in the identical manner as shown in this post for underarms, thus easing the entire garment for better fit, as well as the side benefit of moving the seams to lower-stress locations.